By now, you probably all know I'm a bit of a nerd. So, of course, I had to have a special manicure for the Doctor Who premier last week. I sorta-recently got some stamp plates, and I've been tinkering around with them. 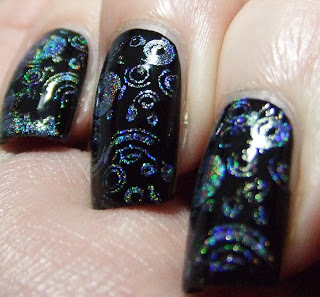 Stamping is tricky, especially when your nails are longer. (Thing #1 calls them my "claws"). But I saw this stamp, and immediately thought it looked a bit like Gallifreyan. Ignore my index finger. It hates me. I did this manicure last Saturday (March 30th. I know, I know...I lag.) As of April 5th, it's still on and mostly intact. I recently went back to using Sally Hansen Double Duty as my basecoat. (That yellow blocker I mentioned a while ago was ok, but seemed to lead to chipping.) And because my Seche Vite is all gloopy and miserable, I've been using the Sally Hansen Insta-Dri topcoat in the red bottle. It really does seem to be a winning combination. I'm not as gentle with my nails as I should be, and I don't reapply topcoat once I'm finished with a manicure. But as you can see below, it is definitely working for me lately. terrible cell phone picture! The lighting at my desk does nothing for holos. 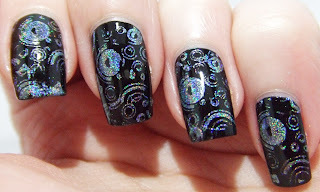 Oh, and in case you missed it, here is my previous Doctor Who manicure.